The compact 4015C Wide Cardioid Microphone from DPA is designed for capturing vocals, close miking instruments, amplifier cabinets, and similar sources in live sound reinforcement and crucial recording applications. It features a wide cardioid condenser element for minimizing off-axis noise and providing a linear tonal response at the off-axis sections. Additionally, the microphone maintains a linear tonal response when closely positioned near speaker cabinets, percussion, and other instruments. There is an output stage that provides faithful recreations of the original source material and an included windscreen and microphone clip. Box Dimensions (LxWxH) 10.8 x 6.2 x 2.0"
4015C Wide Cardioid Microphone (Compact) is rated 5.0 out of 5 by 1. 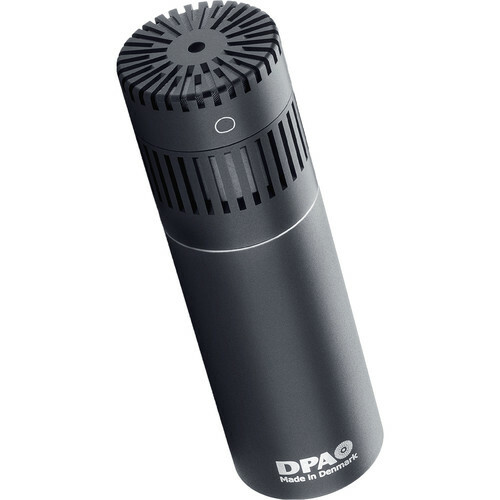 Rated 5 out of 5 by Adrien from Detail & portability I love the detail that this mic picks up. The wider spread and small footprint makes it ideal for doing field recordings for sampling in music and foley. Close mikig does a good job of isolating asound, while pulling it back sets it in its environment, and its size allows it to be camera mounted with ease. Great mic!